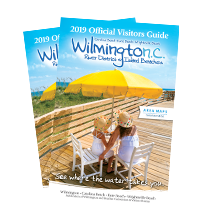 What better way to celebrate Mother’s Day (Sunday, May 8) than with a visit to Wilmington, North Carolina and its island beaches? Whether you’re spending the entire weekend or just visiting for the day, here are a few activities from the river to the sea that Mom and the family are sure to enjoy. May 7: Family Farm Day. 9am-12pm. Families can spend the morning with chickens, bunnies and other animals; pony rides, herb-planting and more. Children’s Museum of Wilmington, 910-254-3534; www.playwilmington.org. May 7: Carnivorous Plant Hike. 12pm. See Venus flytrap & more carnivorous plants on a guided plant hike. Carolina Beach State Park, Carolina Beach. Free. 910-458-8206; www.ncparks.gov/Visit/parks/cabe/events.php. *Children’s Museum of Wilmington. Mothers admitted free today only. Admission charge for guests accompanying Mom. 116 Orange Street, Wilmington. 910-254-3534; www.playwilmington.org. May 8: Mother’s Day Narrated Dessert Cruise. 1pm & 3pm. Treat Mom to a 90-minute narrated dessert cruise of the storied Cape Fear River. Admission charge. Advance reservations. Boards at 12:45pm & 2:45pm from Riverwalk at 212 S. Water St., Wilmington. 910-338-3134; www.wilmingtonwatertours.net . May 8: Mother’s Day Jazz Brunch. 11:30am-2pm. Music by jazz pianist Grenoldo Frazier. Admission charge; advance reservations/tickets required. Theatre Now, Wilmington. 910-399-3669; www.theatrewilmington.com. And that’s not all! There are parks, gardens, museums, tours and Mother’s Day brunches all weekend long. For a complete Events Calendar, visit www.WilmingtonAndBeaches.com/events-calendar. For special offers and visitor information, visit www.GoWilmingtonAndBeaches.com or call 1-866-266-9690.